I just did a taobao.com haul a few weeks ago, and I'm very pleased with the items I got. The items I got are all Liz Lisa, obviously they are fake but I got them for really cheap prices! 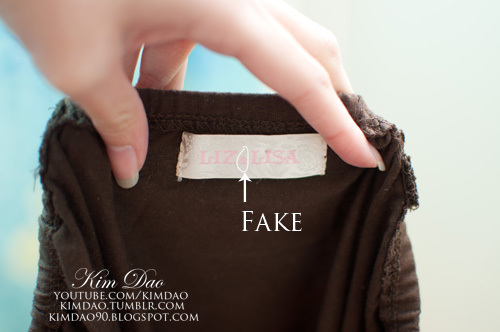 So for those that can't afford the real Liz Lisa clothing, let me tell you, these fakes are damn good. They are extremely cheap, and the quality is actually pretty good. So Anz and I were having a conversation and were questioning whether the items sold on sweetgyarushop are real. As I have had a bad experience with them before, I knew that the owner must've been getting her stuff online somewhere, I highly doubted she had access to the original Liz Lisa factories. How did I know? Her emails didn't sound very convincing and professional when I emailed her and called her out for selling fake Liz Lisa clothes. So, as stubborn as I am, I kept on searching until I found out. Didn't take long until I found out where she got the clothes from... TAOBAO! At first I was shocked, everything was SO cheap! Dresses were sold for around $15-$20, tops are around $10, bags are around $8. I couldn't believe it! The good thing about these taobao shops is that they upload their OWN photo of the item so you will see what you will get. They are all watermarked, so shops like kumimakiko and sweetgyarushop just steal the photo and (badly) chuck their logo on top. Of course, I couldn't help myself. I bought heaps of stuff! Just a little bit of information: sites like kumimakiko and sweetgyarushop (also known as "Sweet biibaby" on Facebook) actually buy their items from taobao and just charge 3x the price. I must also say, those sites do a pretty bad job of trying to hide the watermarks from the taobao stores they steal their photos from, at least learn how to use the clone tool, it's not that hard. Stay away from those sites if you don't want to get ripped off. Trust me, the stuff on taobao is CHEAP. Don't trust what they say about their stuff being 100% authentic, they are lying and just trying to play with your mind. They don't want to help people get Japanese gyaru clothing, they just want money. I really like this, the print is really pretty and the quality of the material is actually pretty good. 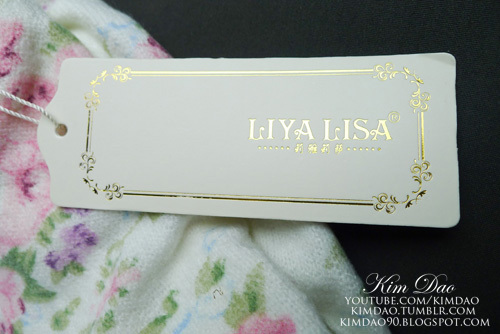 The label actually says "Liya Lisa" lol. Pretty funny, but at least the quality is nice. These are decent for the quality. I wouldn't say they are the best though. I could tell straight away when touching these that they are fake. I saw the real ones when I was in Japan and the quality of the material was very different. I still like them, still really cute and they were cheap. I got them in 2 colours, brown and white. You can tell these are fake straight away. They have an extra "&"
Fake. 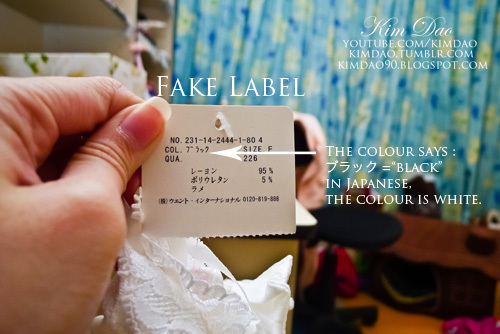 I'll post a comparison photo of a real and fake tag later. But for those of you who can read Japanese, the "Colour" label says "Black" in Japanese when the item is brown. Now, compare that tag with the tag above.. Notice something? They're both the same, including the colour when they obviously are different colours. I was kind of annoyed because I wanted one with pink flowers but instead I got one with orange flowers. Oh well, it still looks nice. Liz Lisa never released an item like this so maybe that's why they decided not to put any labels or tags on it. 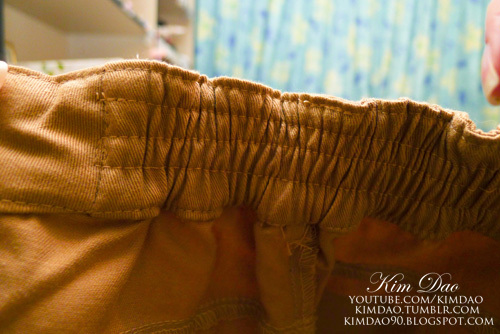 These shorts were a bit big for me but I got my mum to fix them for me. I do like these shorts a lot, they go well with a lot of my clothing. I can tell the material is cheap though, but it still looks good. I've wanted these shorts for quite a while. I actually bought one before from an Asian wholesale site but the quality was horrible. 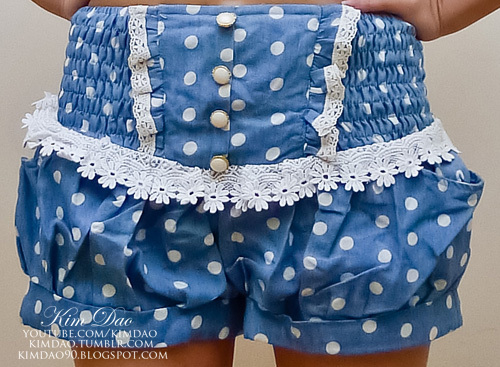 I really love the quality of these shorts though! They are so cute! Notice how "Liz Lisa" are squished together? I LOVE these shorts! They go well with everything and look really nice! The quality of the material is quite cheap but it still looks nice! You can actually buy the Liz Lisa labels! Overall, I'm VERY happy with my order. Yes, I know they are fake but the quality is so good. For the price I got them for, I'm very satisfied. 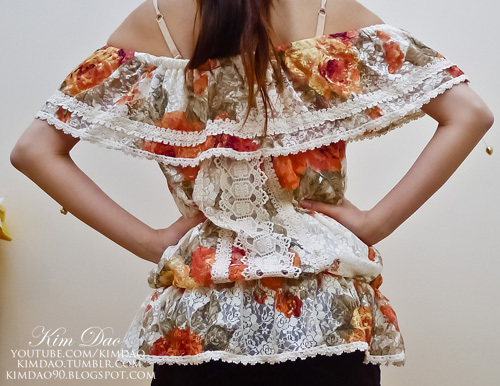 I'm just glad that I have never ordered Liz Lisa clothes from kumimakiko or sweetgyarushop before, since I know some people who have and feel very ripped off. It's unfair to everyone who works hard for their money. Would I order again from taobao? Of course! These imitations look almost real for a much cheaper price. I told myself I would never buy Liz Lisa online anymore after hearing stories of sites selling fakes for almost the same as the retail price. So now, how do you order from Taobao.com? Unfortunately you need to get a shipping service if you don't live in China or Hong Kong. I used taobaospree.com which was pretty good in my opinion. They replied to emails super fast and processed my order very fast, very satisfied with their service! 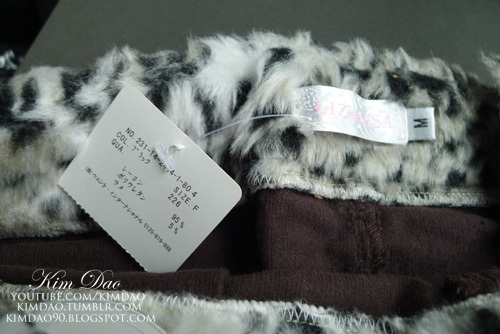 For those who want AUTHENTIC Liz Lisa clothing, yes, you CAN buy authentic clothing online. You can go on Yahoo! Japan Auctions, usually some people sell their used Liz Lisa clothing. You have to get a shipping service though. ShoppingmallJapan.com is an option. OR, you can buy from the Liz Lisa Official Rakuten store. They ship worldwide but it is a bit pricey. 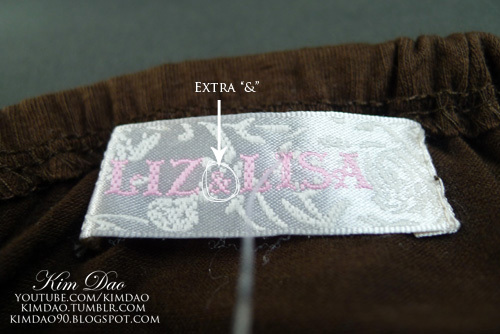 There are MANY sites claiming they sell authentic Liz Lisa when they actually don't. If you guys want me to have a look at the sites then feel free to comment on this post and I will get back to you as soon as possible. 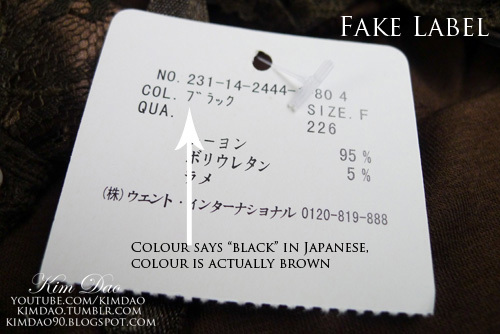 Don't be fooled by sites who claim to get the items straight from the China factories. 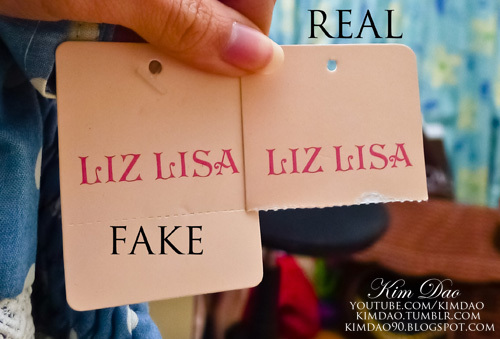 Next post will be a comparison post between real and fake Liz Lisa labels. 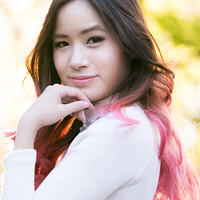 I'll be doing a blog post/video on how to navigate and shop on taobao after my exams! I love the dress :O So cute!!! i love taobao too, and the clothes you got are amazing! WOW! I want those stuff too :-) unfortunately, I dunno chinese-I wonder if I can still order...BTW how many days did you have to wait for it to be shipped? I really love the dress too hehe ^^ You should definitely do a haul there! And yeap! 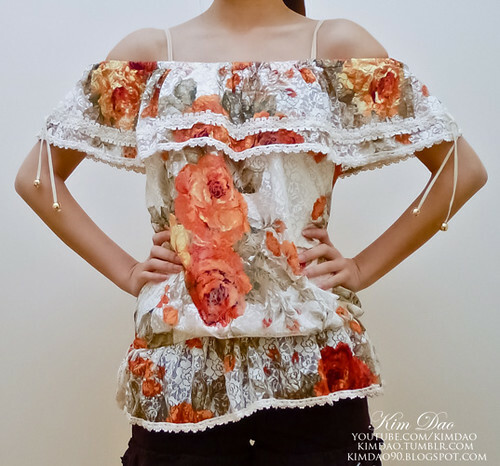 I saw the photo of angelababy wearing the sweater and just thought "OMG I must have it!" hahaha. LOL!!! I know that website too!!! Well only after looking at a lot of photos from sweetgyarushop! she didn't cover one of her photos really well and I found out where some of her products came from!!! Currently, I'm buying my liz lisa item from "♥♥♥日系商店♥♥♥". She has a facebook shop too. It seems she really knows the stuff she is selling. So far, none of the liz lisa item she send me are fake. 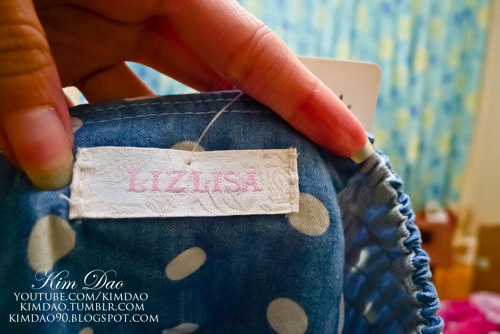 She told me she don't get her stuff from taobao because she knows the actual liz lisa factory in CHINA. I'm not sure if she is telling the truth, but I'm very satisfied with all my purchase from her. Also, all her liz lisa items are buy 1(10% off) or buy 2(12%off). Hey !! wow i never knew that those sites sell fakes! i was about to buy from them! >< but now i know to shop at taobao.com thanks to you =) i explored the site but everythigns in chinese i cant read chinese and i am chinese myself ==" so i went on the taobaospree.com thingo and it doesnt look that promising considering once you open the site there is a warning notice about someone posing to cheat money and that the fact that they aren't responsible for anything... so imma worried about where my moneys going. but i wanted to ask you how much were the shipping fees? expensive ? i live in sydney btw. hehe sure! Hope you have fun shopping~! You don't happen to know if there's a way to tell from the taobao shop's page if something is Out of Stock? I, of course, ordered from sweetgyarushop. At first, it hadn't occurred to me to me that I'd be buying replicas. They are a bit overpriced when I consider I'm not paying for the name (plus the shipping, gah, the shipping...), but still definitely good quality, so I'm not too upset. Beautiful haul by the way, the orange is vibrant (love that top). I have the opposite problem with the bottoms... I'm always worried they won't fit, as that is where I carry most of my body fat. It's unfortunate, b/c even when I try to lose weight, it's most noticeable in my upper body, where I really don't need to lose fat, lol. Anyway, I'll look into Taobao if my holiday haul from rakuten doesn't work out, and probably next year as well. Could you tell me which sellers had them? I want to purchase liz lisa style clothing from taobao too, but it's a bit overwhelming at first... Thanks! Yeah, the fakes are good quality which is why I don't mind buying them haha. But yeah next time order from taobao to save money since you're buying the exactly the same item they sell. Thanks Susan! I will definitely use taobaospree again the next time I order! Really recommend your services to everyone else! great post. i was actually on the verge of buying a lucky bag from sweetgyarushop, but after reading this article i decided not to (much to the relief of my bank account...for now) - so you've just saved me £62 ($102)!! thanks for the tip! 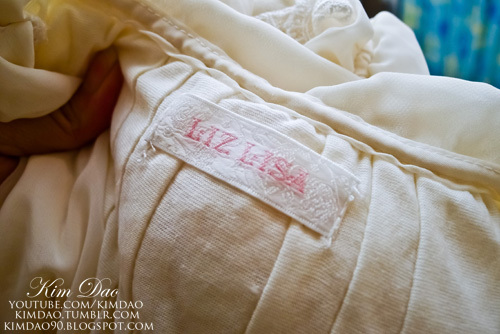 will be checking taobao in the near future as they seem of have LOADS of Liz Lisa stuff, real or fake. Does TaoBao offer any international shipping to USA? Yeah, it's true unfortunately :( If you wanted to buy shoes, just look on taobao. They have heaps of Liz Lisa shoes for 1/3 of the price! The shipping fee is a little expensive, depends on how much you buy. If you are not from China you have to get a shipping service, so I used taobaospree.com ^^ I'm pretty sure they can also send to France! Hi! Sorry for the late reply! And yes! I definitely recommend them still! I plan to buy some more soon! Okay, then, I will buy from them too ! :D I searched quite a long time through a lot of sellers of Liz Lisa, & same kind of brand, clothes, and I think I really fell in love with all these clothes xD Even if they are fake, it is true that they still look nice on your pictures. All our items are got from the supplier directly, they are authentic. Since official website usually show the latest items, so some items may not be found on it. For further inquiries, please feel free to contact us." 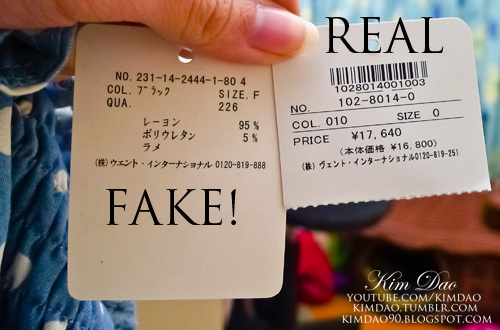 Shame on kumimakiko for selling fake items & claimed for authentic in unreasonable price! If I want to purchase items from Taobao through Taobaospree, do I have to register Taobao? I don't live in China. Also, does vividxh offer combine shipping?! Thanks so much! Hi, is it cheaper to ship back by taobao web itself or by taobaospree? Nope, you dont have to register ^^ All I did was gave the links to what I wanted to the shipping service and they calculated the pricings for me ^^ And yeah usually they offer combined shipping! So, when you 1st made an order with them, how long do they take for process or reply? Yeah, you can leave everything blank and they will fill it out for you. Also i have had bad experiance with shopping services before, ordered some boots fromt TsubasaMasukwaka store and the shopping service ended up costing memore than twice as much as the boots >.<! so im a little wary, does taobaospree.com have reasonable prices? did they change the prices, or is that not in american dollars? I've been ordering from Taobao spree for a while now, but with my most recent order, they responded saying they can no longer accept Paypal as a payment method when buying "fake famous brands" like LizLisa. I couldn't really get a clear answer from them as to why... I'm a little weirded out by it. Have you ordered from them recently and have them say this? It was on the 8th of April that they sent me that response, when I tried adding something to an order. I set up a Western Union account because they said that and moneygram are the only things they accept now when buying LizLisa, but Western Union charges a ton of money for their services... As of now I'm using a different Taobao agent. They said they would accept Paypal as long as the items are in small quantity, whatever that means. :/ Let me know if you get this reponse from Taobao Spree next time you order. They wouldn't really give me more information as to why they changed their policy. how do you know how much everything costs?? i want to buy stuff taobao, everything is co cute!!! Do you mind linking me to your first top? It's so adorable! How do you buy from taobao if they only ship in china and stuff? Hi Kim, I live in Australia too and how much did shipping cost u? 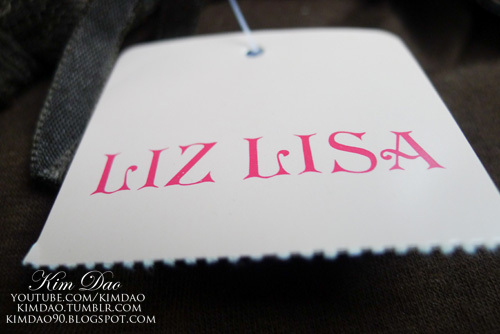 hi Kim, I would like to ask, do you have the link of the buyer who sell the Liz Lisa sweater? Thanks. Thank you for the warning entry! Interessting. 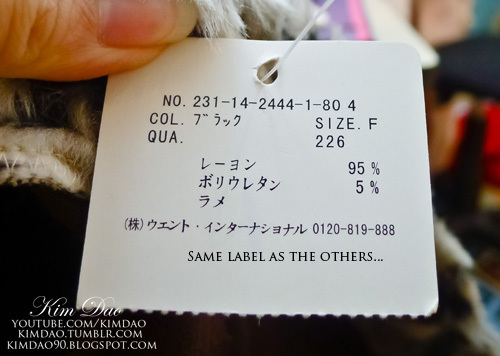 Sadly I still thought Kumiko sell not brand clothes, because of the price. It's altough bad, that they steal the original Names, to use as their own fakes. LIZLISA clothes r better to fake as MA*RS clothes. I want them so hard, but I think I'll ask friends to buy me the dress I want. The quality is often good as well, but the colors also don't look like real. Hello do you have the taobao link for the brown short? Hi, do u live in the USA? If so, did they tax you at all in customs? It's probably bc PayPal has very strict regulations about the sale of fakes. You buy them from the seller and they file a PayPal dispute saying "omg they are fake!" and send pics of the tags. Then the seller would be forced to give you the money back. Wow great post thanks for sharing it with us. I so love the sweater! Very lovely! You should check out some english version of Taobao like http://taobaosoeasy.com/, they have very cheap fashion clothes and other formal dresses Taobao. italian/australia/Israel clients to buy from Taobao more than 3 years. Hi do you have the link for the white bow blouse? 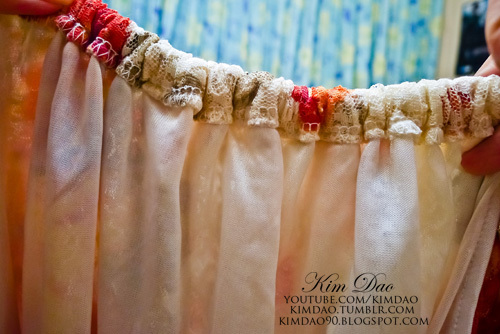 Hi Kim, i recently became really interested and Liz Lisa clothes and i found your blog. ^^ I found this shop on storenvy called Kawaii Gyaru Shop that sells Liz Lisa clothes. I was wondering if you've bought from them before and know if they are reliable? I've seen multiple good reviews,but i just wanted to make sure. Thanks! Would you please take a look at this website? Do you think they sell the authentic Liz Lisa http://www.kawaiigyarushop.com? Thank you!